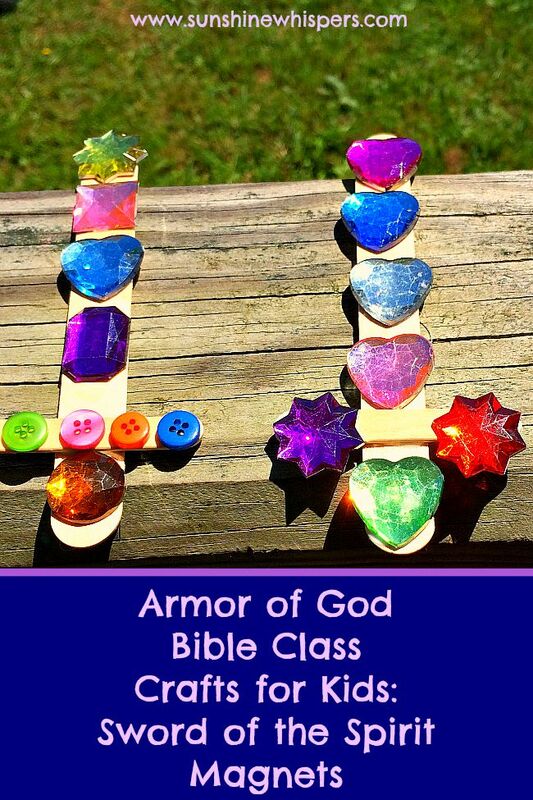 Thank you so much for joining me for the Armor of God Bible Class Crafts for Kids series. I had a blast teaching Ephesians 6 to a great bunch of 8-year old girls this summer. I think they had a pretty good time too. One of the highlights was the fact that we made some really cute Armor of God-inspired crafts, and used them to bring home some of the main points about spiritual warfare and the Armor of God. 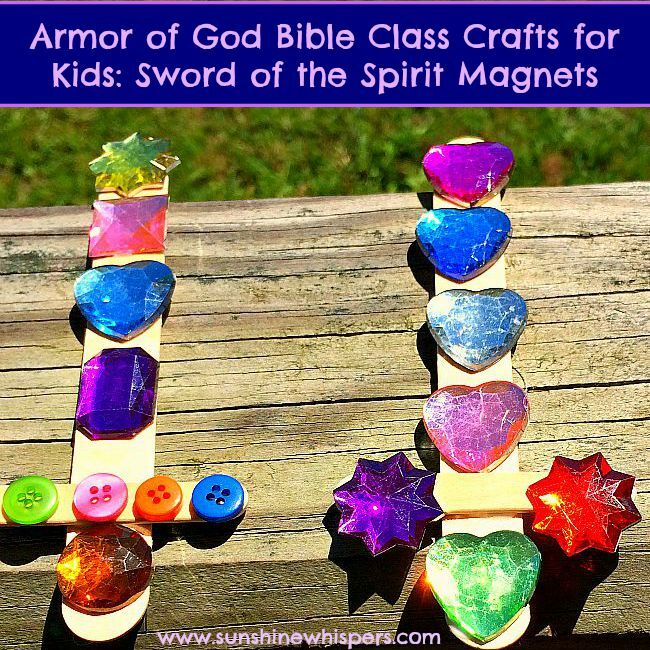 The last craft we made were these super cute (and sparkly) Sword of the Spirit magnets. Check out the instructions for this easy craft below! It would be difficult to talk about the sword of the spirit without making reference to the Bible. So, in preparation for this craft, we discussed how important the Bible was to the Christian faith. I pulled out a few old U.S. Army manuals and talked about how everything I needed to know about how to be a Soldier was contained in the manuals– first aid, orienteering, the code of conduct, etc… The Bible serves the same purpose for a Christian. I then had one of the girls read Hebrews 4:12– “For the word of God is living and active, sharper than any two-edged sword, piercing to the division of soul and of spirit, of joints and of marrow, and discerning the thoughts and intentions of the heart.” Now for the craft. Glue the mini craft stick to the bigger craft stick to make a sword. Let the kids pick out buttons and jewels to decorate their sword. 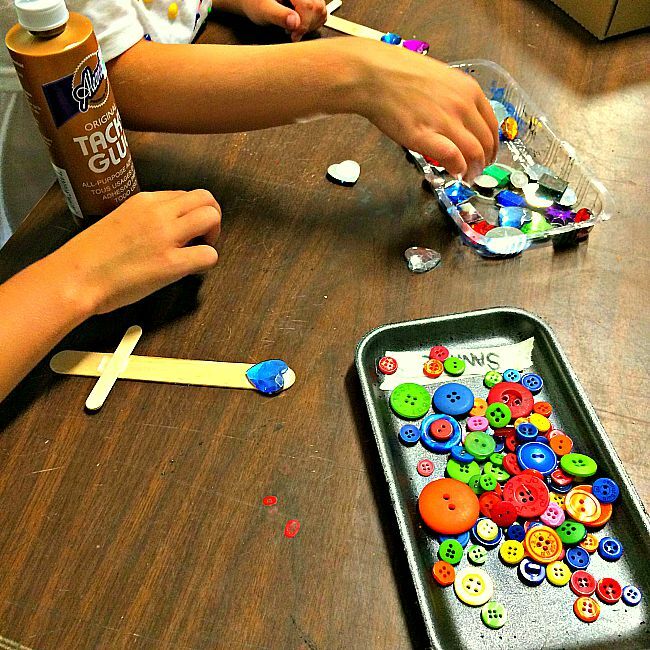 The kids can then glue the jewels and buttons onto the sword. Cut a piece of magnetic tape the length of the larger craft stick. Peel the paper off of the back of the magnetic tape. Use the hot glue gun to glue the magnet strip to the back of the sword. It shouldn’t take too long for the jewels and buttons to dry. Just to make sure, you may want to wait about 1 hour before you mess with the magnet. Isn’t that easy and cute? Thanks so much for taking the time to visit! Have a great weekend!